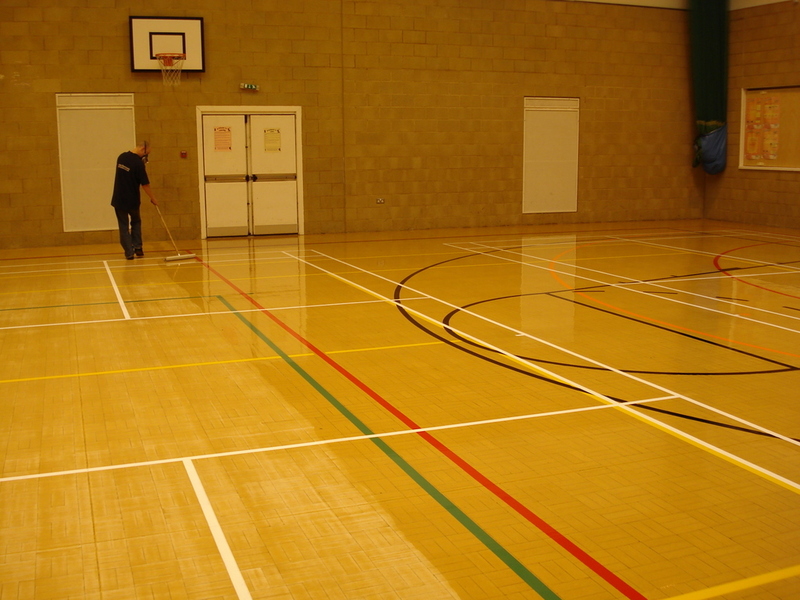 Floorcare Services – Sports Hall Floor Specialists. Composition or Composite Block (Granwood) Sports Hall Flooring Cleaned / Scrubbed, Abraded and Re-sealed by Floorcare Services. Composition / Composite Block (Granwood) Sports Hall Flooring Refurbishment. Sports Over Line / Court Marking. 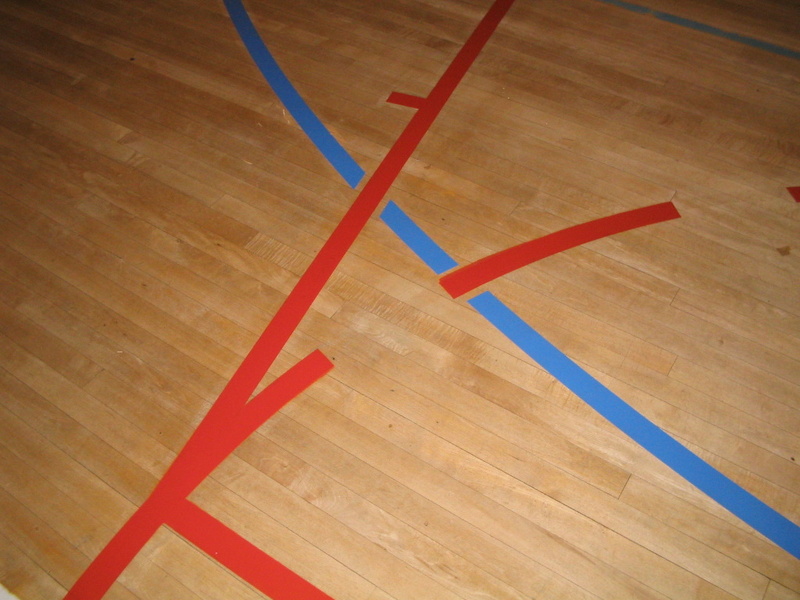 Over Line / Court marked with a Basketball Court in Black, Netball Court in Red, Volleyball Court in Green, 5-a-side Court in Blue, Tennis Court in Yellow and 4 Badminton Courts in White using hard wearing two pack epoxy paint. Sealed with 2 coats of heavy duty Sports Hall floor Seal from Floortech Products – Sportguard, Formulated & Manufactured to comply with the requirements of B.S. 7044 part 4, Artificial Sports Surfaces and B.S. EN 14904 slip resistance for indoor sports surfaces. Floorcare Services completed this Composition or Composite Block (Granwood) Floor Cleaning / Scrubbing, Abrading, Line / Court Marking and Sealing in Rugby, Warwickshire. 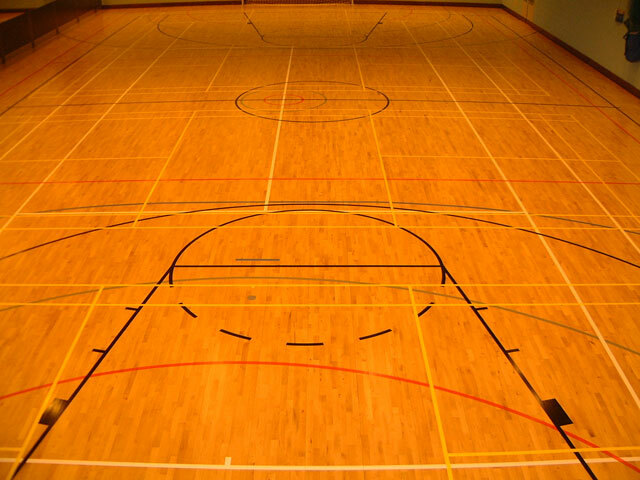 Sports Hall flooring Specialists working with Wood Strip, Wood Block, Composition / Composite Block (Granwood), Gransprung and Vinyl Floors. Sanding and Sealing of existing Hardwood / Softwood and Composition Block (Granwood) Sports Hall floors. Sports Hall floor Sanding ( Any size floor Area ). 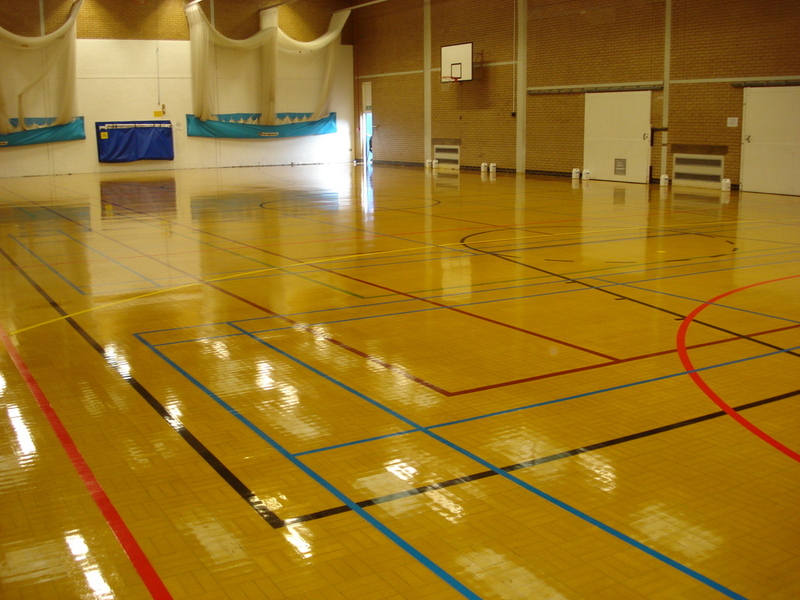 Cleaning / Scrubbing, Abrading and Re-sealing of all types of Sports Hall Floors. 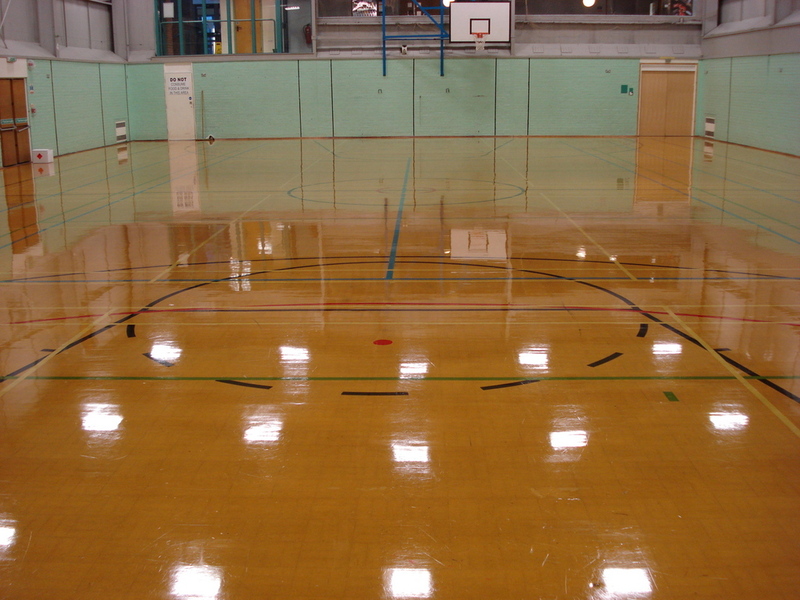 Repairs / Replacements to all types of Sports Hall Floors. The installation of a range of solid hardwood flooring system installed, portable, sprung and fixed. 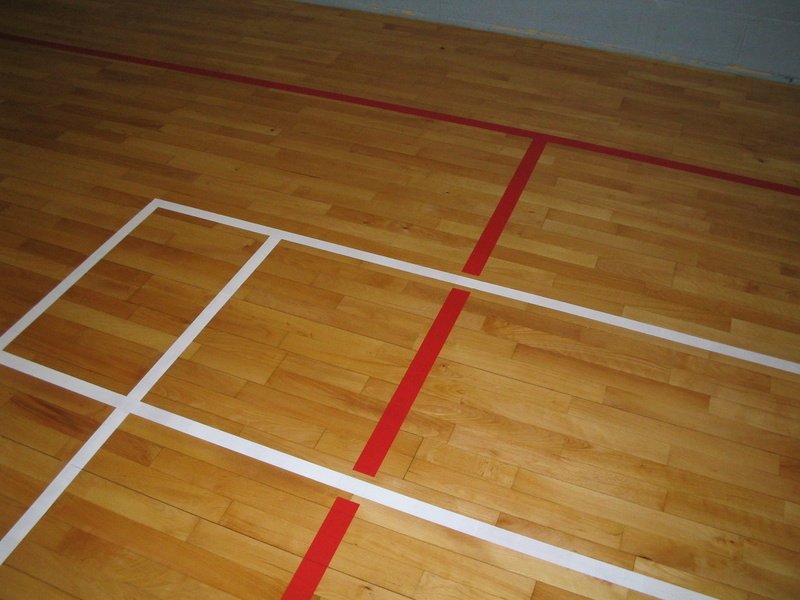 Line / Court Marking of any New indoor court, Any Size, Any Colour. Over-Line / Court Marking of existing worn Courts. Nationwide coverage around the U.K.
We’re confident that we can provide you with the Sports Hall Floor you desire, finished to the highest standards and quality and the most competitive prices. We work very closely with our Seal Manufacturer, so closely in fact we share our warehouse premises with them where seal’s are Developed, Formulated and Manufactured, so we know that we can quote a cheaper price than most other flooring companies due to our seal costs being dramatically lower that other contractors. As a family owned and run company we pay meticulous attention to detail and our aim is to work as a unit to achieve the best possible standards of work completed by us on every individual job we undertake. At Floorcare Services we understand that time is always a factor with Sports Hall floors and know that when a floor is ‘out of action’ it’s not earning money and bookings are lost, so we are more than happy to offer Saturday’s and Sunday’s to complete flooring works, and even nights can be offered to complete flooring works upon request to minimise any disruption to your schedule. View the Sports Hall Gallery. View the Sports Hall Floor Video’s. Sports Hall Flooring Sanded and Sealed by Floorcare Services. Hardwood Strip Sports Hall Flooring Refurbishment. After sanding the floor back to bare wood we completed the Line / Court marking of 4 Badminton Courts in White, A Basketball Court in Black, A Volleyball Court in Green, A 5-a-side Court in Blue, A Tennis Court in Yellow and a Netball Court in Red using hard wearing two pack epoxy paint. 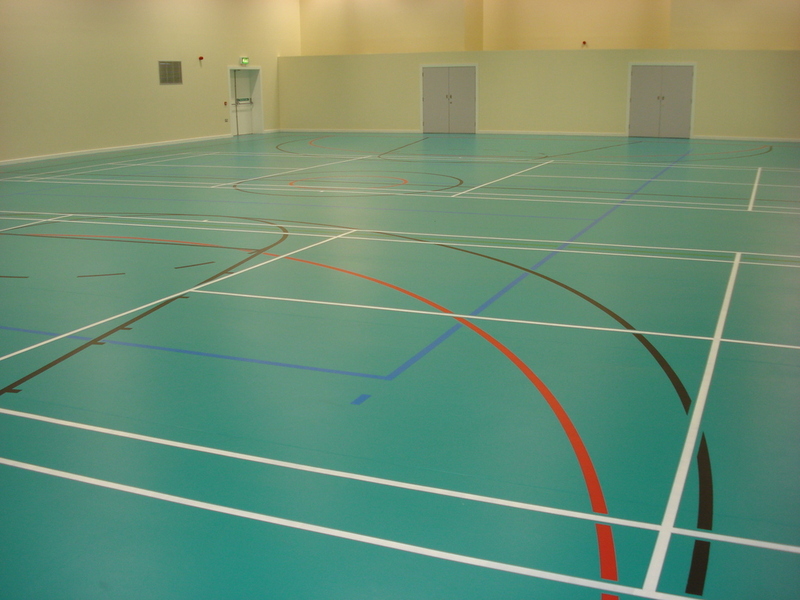 Sealed with 2 coats of heavy duty Floortech Products – Sportguard, A Sports Hall floor Seal Formulated and Manufactured to comply with the requirements of B.S. 7044 part 4, Artificial Sports Surfaces and B.S. EN 14904 slip resistance for indoor sports surfaces. Damaged and faded Court Markings Over-Lined by Floorcare Services. Completed in the same colours and protected 2 coats of heavy duty flooring Seal on top. Sports hall flooring Cleaned / Scrubbed, Abraded, Over Line / Court Marked and Sealed. Composition or Composite Block (Granwood) Sports Hall Floor Resurfacing. 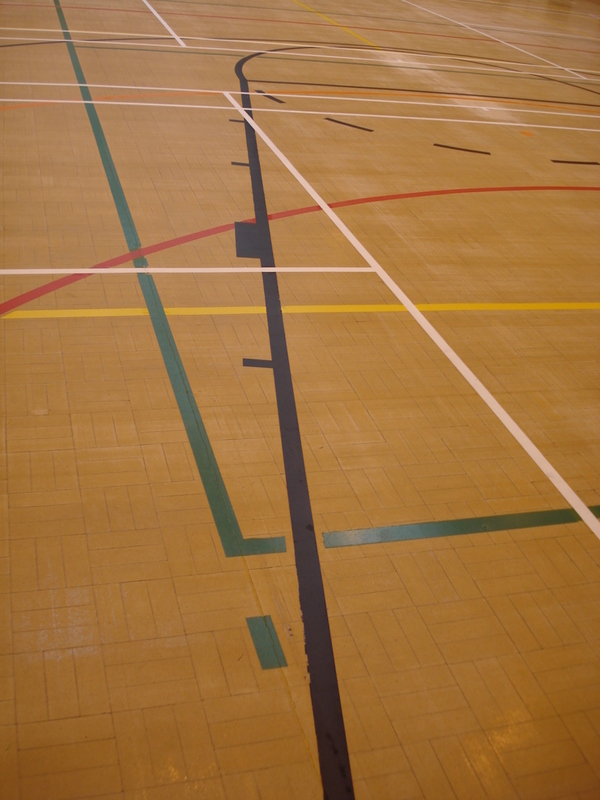 Sports Hall flooring contractors, Line / Court Marking using hard wearing two pack epoxy paint. Sealed with 2 coats of Floortech Products – Sportguard, heavy duty Sports Hall floor Seal Formulated and Manufactured to comply with the requirements of B.S. 7044 part 4, Artificial Sports Surfaces and B.S. EN 14904 slip resistance for indoor sports surfaces. 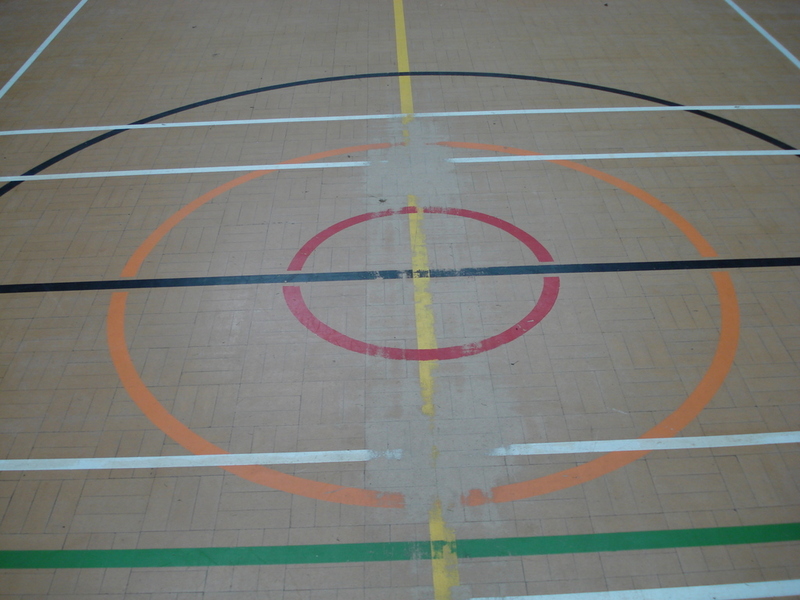 Sports Hall Floor Court / Line Marking by Floorcare Services. 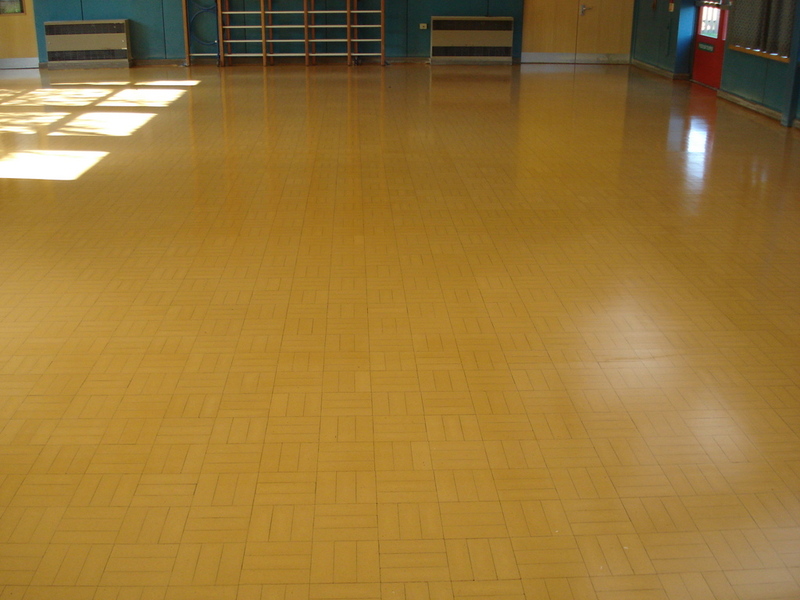 Vinyl Sports Hall Flooring Cleaned / Scrubbed, Abraded and Re-sealed by Floorcare Services. 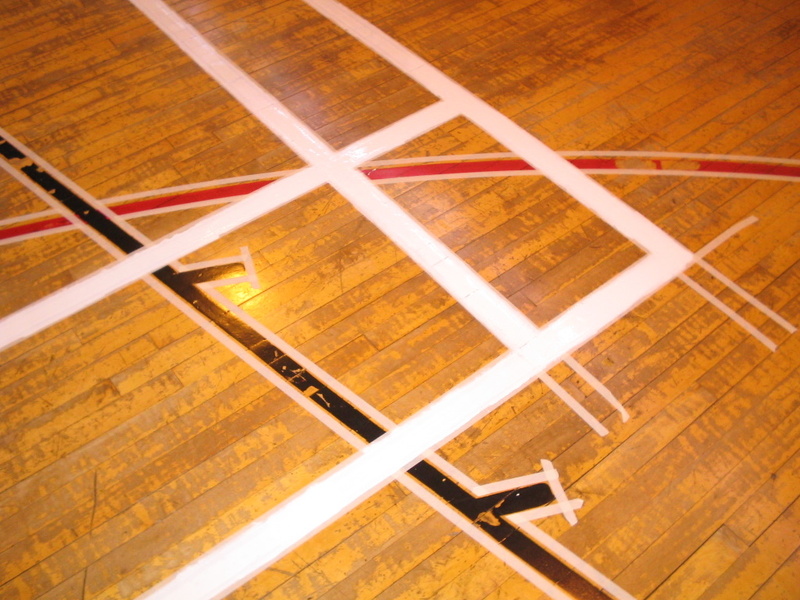 Sports Line / Court Marking with a Basketball Court in Black, Netball Court in Red, Volleyball Court in Blue, and 2 Badminton Courts in White using hard wearing two pack epoxy paint. Sealed with 2 coats of heavy duty Sports Hall Hard wearing vinyl polish with added polyurethane from Floortech Products – Special Drybright Metallised Polish. 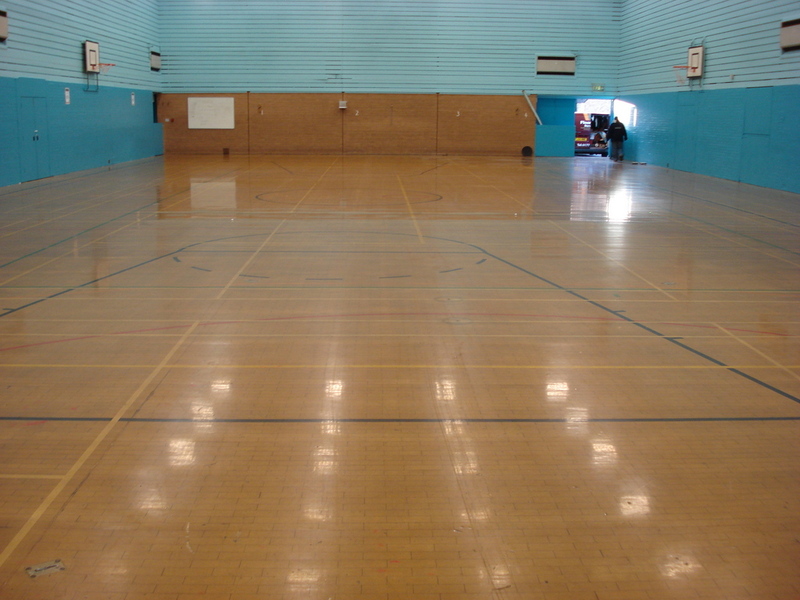 Floorcare Services completed this Vinyl Sports Hall Floor Cleaning / Scrubbing, Abrading, Line / Court Marking and Sealing in Mackworth, Derbyshire. 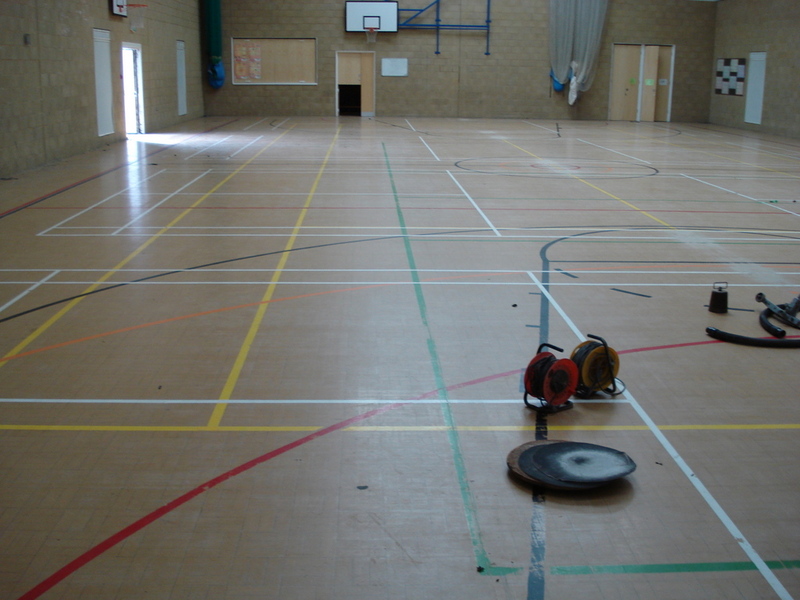 Sports Hall Floor Cleaned / Scrubbed, Abraded and Re-sealed by Floorcare Services. The photos show the first Coat of Floortech Products – Aquaguard Heavy Duty Sports Hall Floor Seal being applied. The Seal is flooded on to the Sport Hall Floor ensure a perfect thick covering for maximum protection. A total of 2 thick Coats are applied to a floor that has been Cleaned / Scrubbed and Abraded using Seal which has been manufactured to comply with the requirements of B.S. EN 14904 slip resistance for indoor sports surfaces. Floorcare Services Cleaned / Scrubbed, Abraded and applied the 1st coat of Seal on 1 day with the following day to final coat only. A Netball Court was also Over Line / Court Marked in Red two pack (2 pack) epoxy Line marking paint before the floor was sealed so the two coats of Aquaguard protected the lines ensuring it will last for a long as possible. Composition or Composite Block (Granwood) Sports Hall Flooring Cleaned / Scrubbed, Abraded and Re-sealed by Floorcare Services. Composition / Composite Block (Granwood) Sports Hall Flooring Restoration. Sports Over Line / Court Marking. 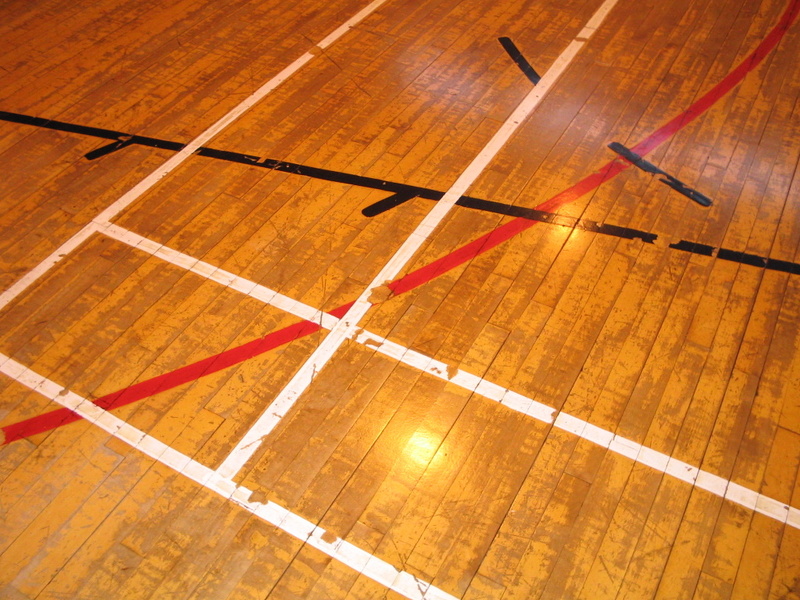 Over Line / Court marked with a Netball Court in Red, and a 5-a-side Court in Yellow using hard wearing two pack epoxy paint. 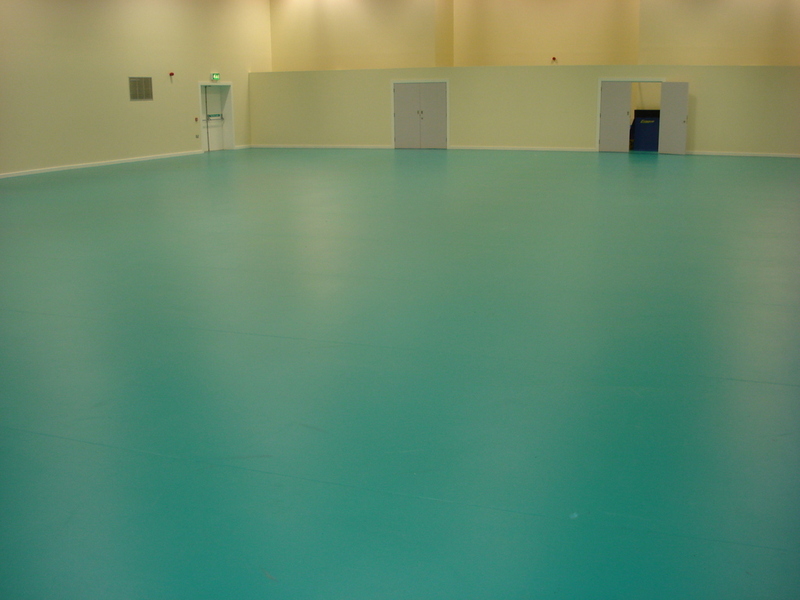 Then sealed with 2 coats of heavy duty Sports Hall floor Seal from Floortech Products – Sportguard, Formulated & Manufactured to comply with the requirements of B.S. 7044 part 4, Artificial Sports Surfaces and B.S. EN 14904 slip resistance for indoor sports surfaces. Floorcare Services completed this Composition or Composite Block (Granwood) Floor Cleaning / Scrubbing, Abrading, Line / Court Marking and Sealing at Trent College Nottingham, Nottinghamshire. Over Line / Court Marking by Floorcare Services. We use two pack Epoxy resin based paints from Floortech Products which are then sealed over to last ensure long lasting results. The existing Lines / Courts are taped out, Painted using the sports court paint which results in clean sharp lines and complete coverage of old courts. The new Line / Court marking are protected with 2 coats of heavy duty floor seal on top. 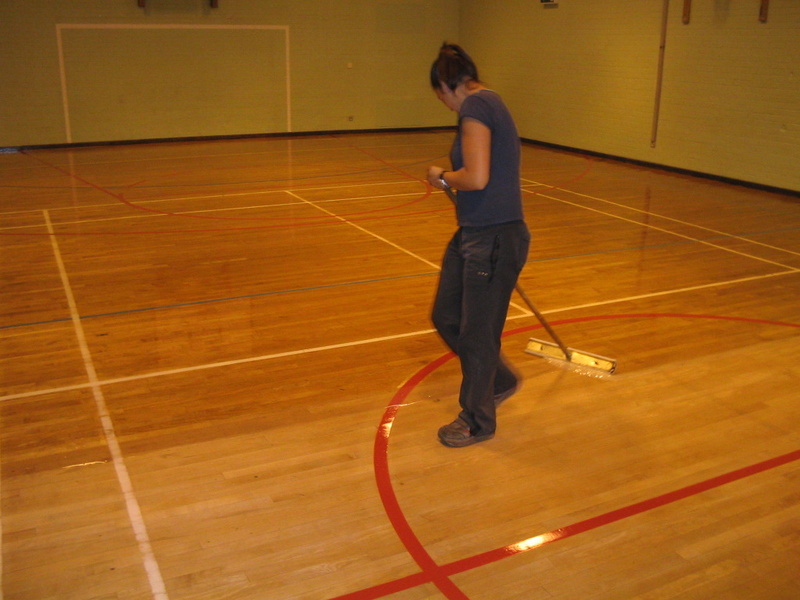 Floorcare Services are Sports Hall Floor specialists. 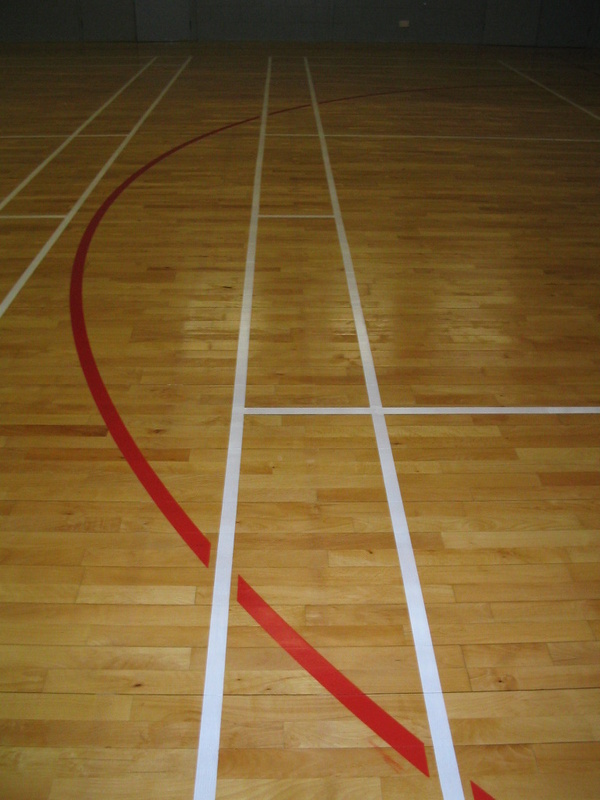 This Sports Hall floor was Sanded and Sealed with Line / Court Marking of Badminton courts (White) and a Netball Court (Red) by Floorcare Services. Composition or Composite Block (Granwood) Sports Hall Flooring Cleaning / Scrubbing, Abrading & Re-sealing by Floorcare Services. 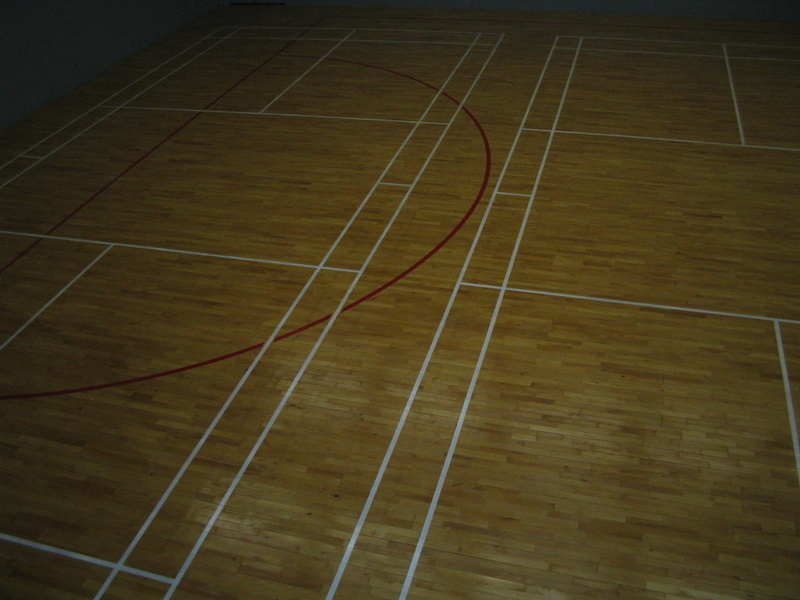 Composition / Composite Block (Granwood) Sports Hall Flooring chemical cleaning without sanding. 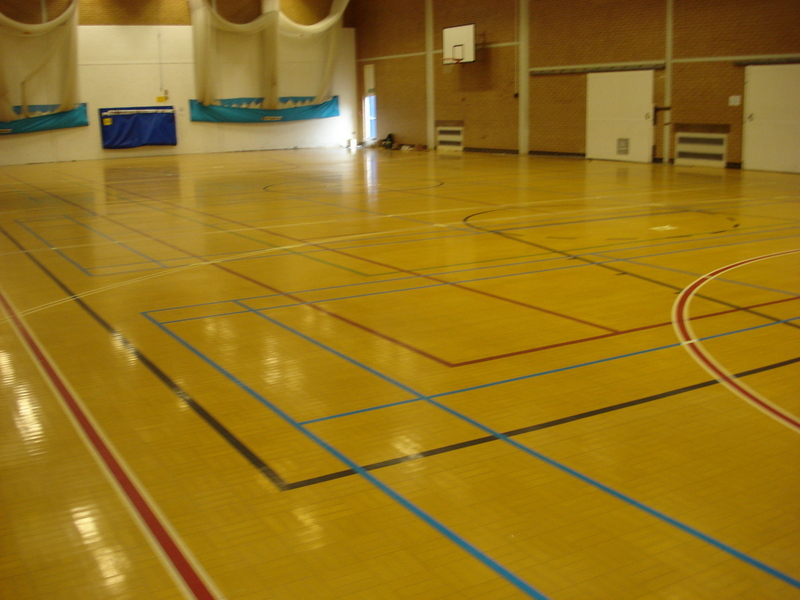 The Sports Hall was Chemically Stripped, Cleaned / Scrubbed, Abraded and Re-sealed by Floorcare Services. 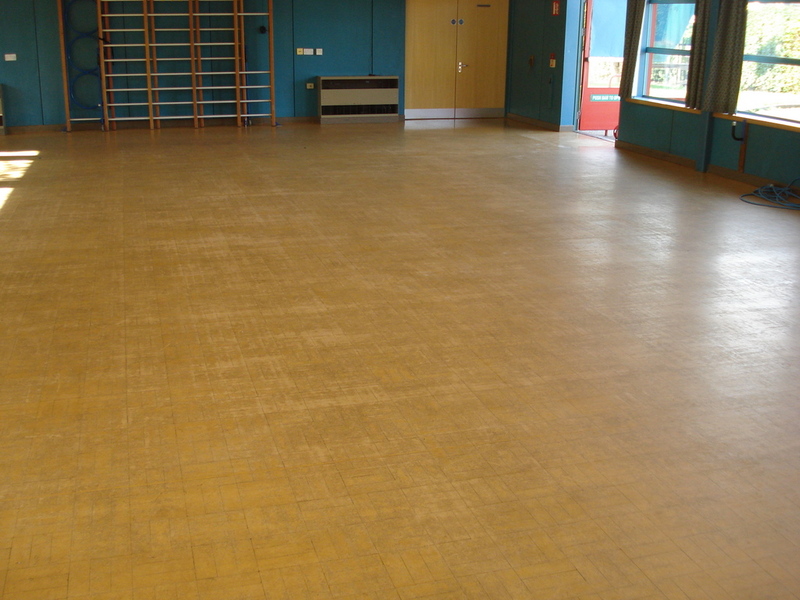 This Composite Block (Granwood) floor was refurbished at Sutton Community Sports Centre, Ellesmere Port, Cheshire. It was Cleaned / Scrubbed and Abraded, then Sealed with 2 coats of ‘Floortech Products – Sportguard’ a solvent based moisture cured polyurethane commercial grade floor seal conforming to EN BS 14904 Slip resistance for indoor sports play. The second/final coat was applied the following day/ day 2. As it wasn’t sanded there was no dust, no material removed from the floor and only took 2 days to complete. Line / Court Marking by Floorcare Services. New Badminton (White) & Netball (Red) courts added in using two pack epoxy paint. Priority of Lines / Courts can be chosen depending on what sports are most played, in this case the White Badminton Lines / Courts have priority over the Red Netball Lines / Courts. Composition or Composite Block (Granwood) Sports Hall Flooring Cleaning / Scrubbing, Abrading & Re-sealing by Floorcare Services. 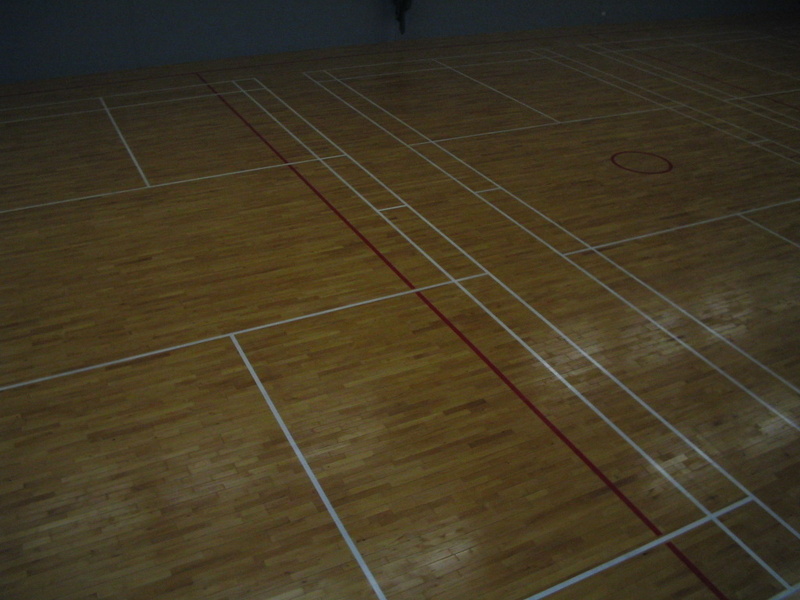 Composition / Composite Block (Granwood) Sports Hall Flooring chemical cleaning without sanding. 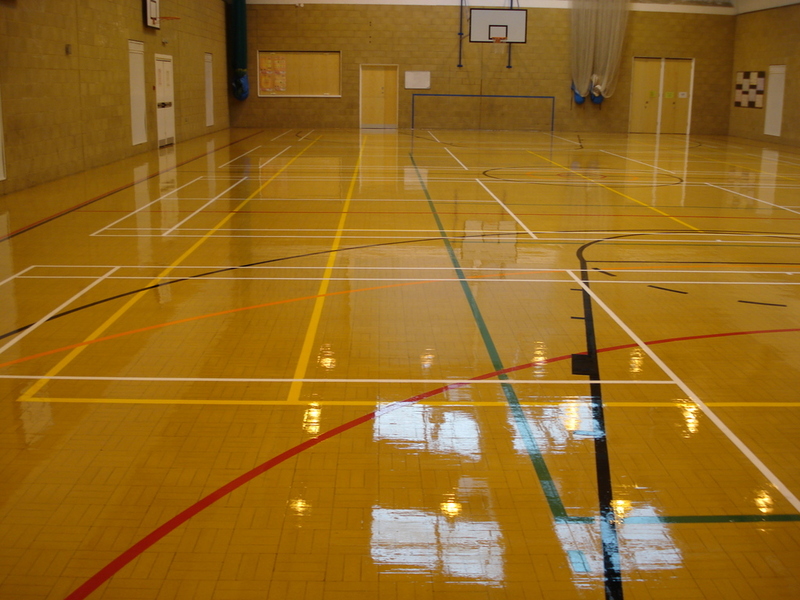 The Sports Hall was Chemically Stripped, Cleaned / Scrubbed, Abraded and Re-sealed by Floorcare Services. This Composite Block (Granwood) floor was refurbished at Newark, Nottinghamshire. It was Cleaned / Scrubbed and Abraded, then Sealed with 2 coats of ‘Floortech Products – Sportguard’ a solvent based moisture cured polyurethane commercial grade floor seal conforming to EN BS 14904 Slip resistance for indoor sports play. The second/final coat was applied the following day/ day 2. As it wasn’t sanded there was no dust, no material removed from the floor and only took 2 days to complete. 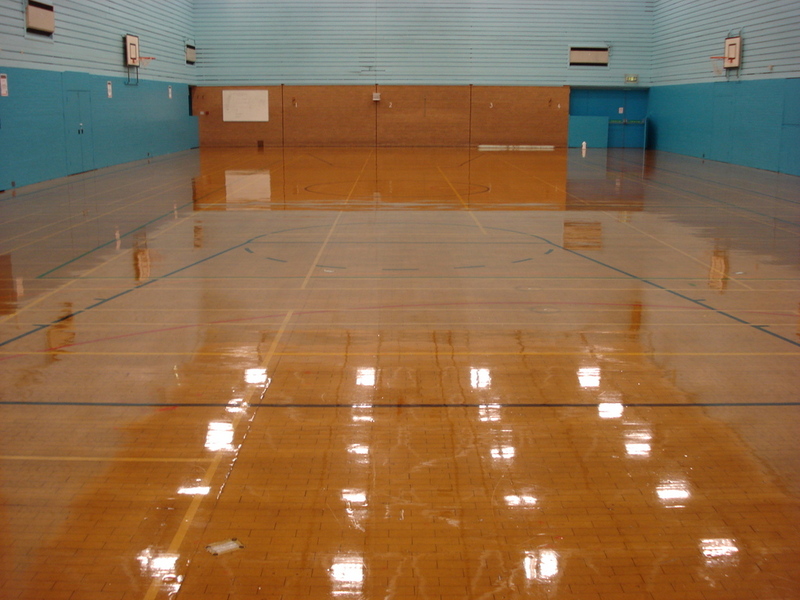 Sports Hall Floor Sanding and Sealing by Floorcare services. 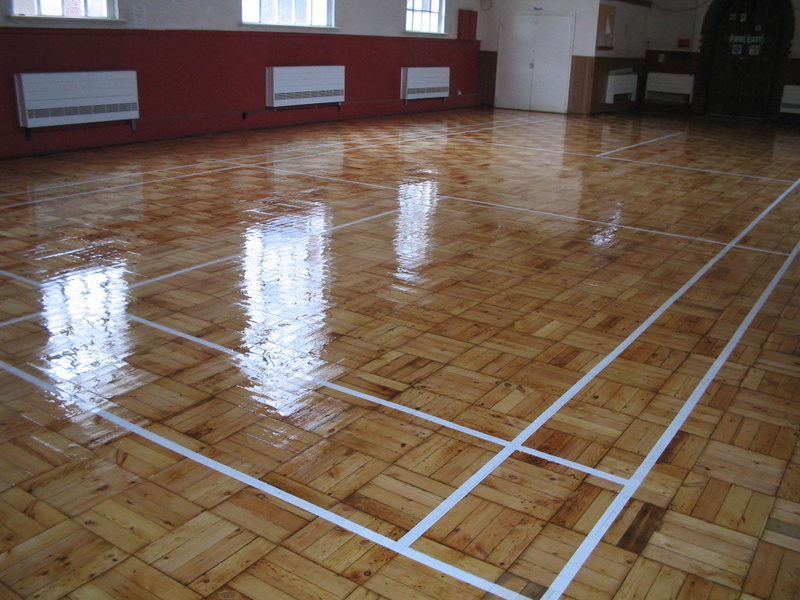 Soft wood Block / Parquet sports Hall floor Sanded, Line / Court Marked, and Sealed with 3 Coats of hard wearing Sports Hall Floor Seal from Floortech Products – Waterthane Super 100. A New Badminton Court in White was added in using two pack epoxy paint. Final coat of seal has just been applied in the after photo. Sports Hall Floor Sanding and Sealing with Line / Court Marking at Uxbridge Community Centre, Buckinghamshire. 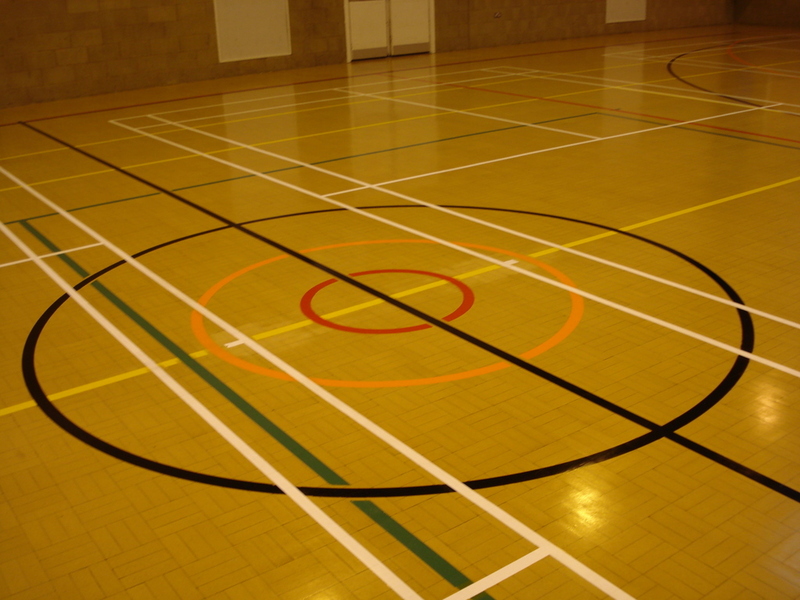 Sports Hall Floor Line / Court Marking by Floorcare Services. 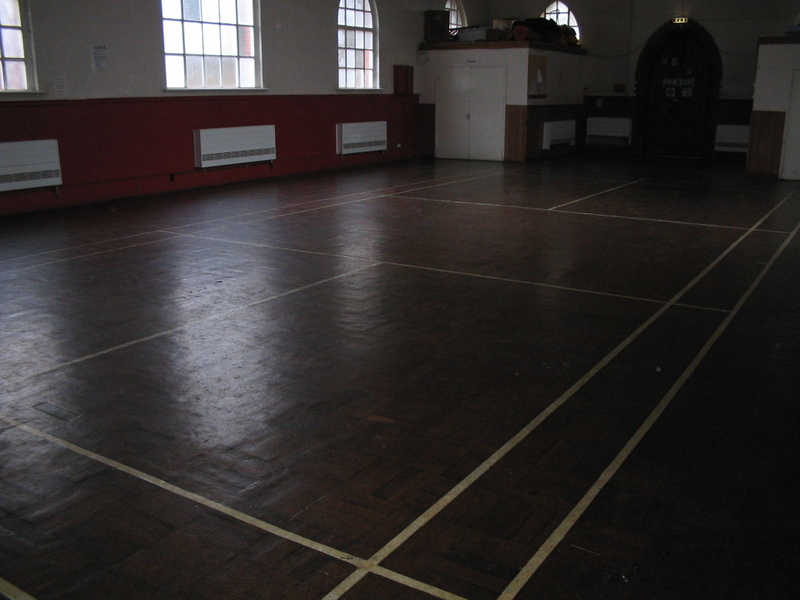 This Composition / Composite Block (Granwood) Sports Hall Floor has been Cleaned / Scrubbed, Abraded and Line / Court Marked. 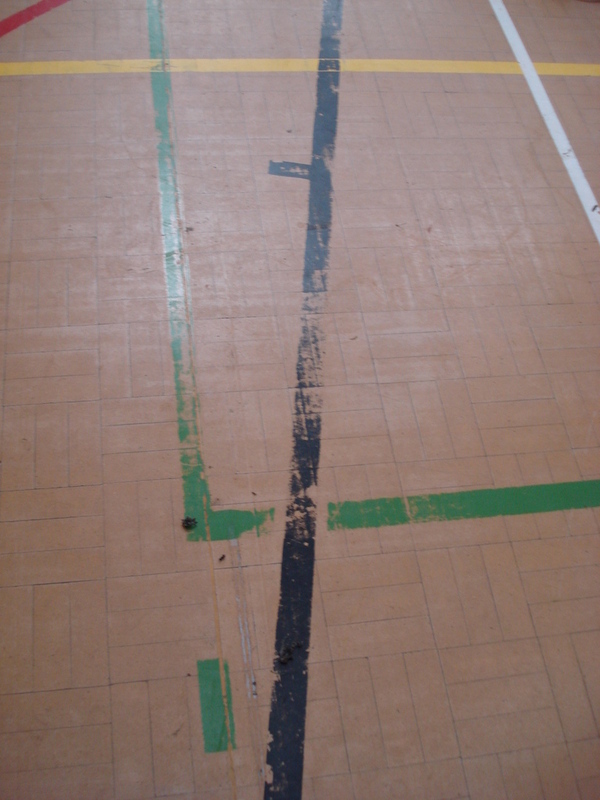 The existing Lines / Courts were badly worn and faded so were Over Line marked in using two pack epoxy paint. The floor still has NOT been sealed in the after photo but the new lines will be protected under 2 coats of heavy duty Sports Hall floor Seal from Floortech Products – Sportguard, formulated and manufactured to comply with the requirements of B.S. 7044 part 4, Artificial Sports Surfaces and B.S. EN 14904 slip resistance for indoor sports surfaces. Floorcare Services completed this Composite Block (Granwood) Floor Cleaning, Abrading, Line / Court Marking and Sealing in Rugby, Warwickshire. 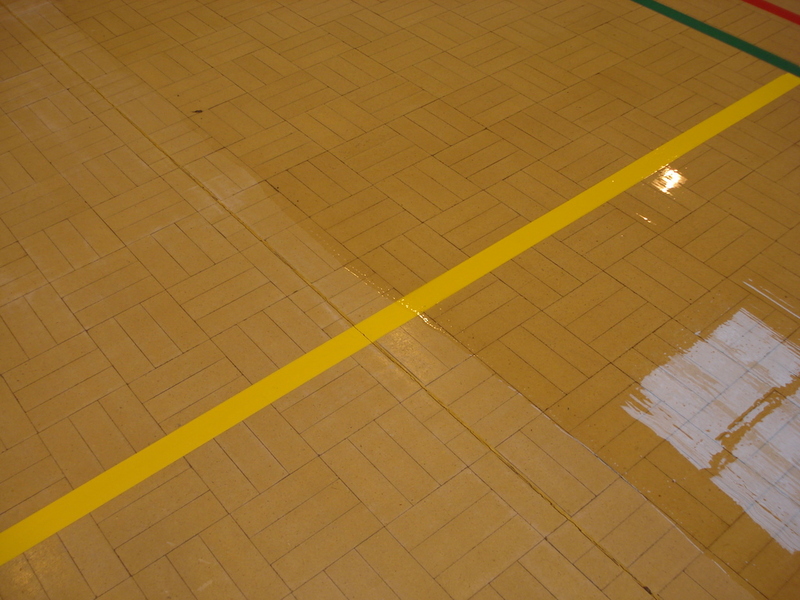 Composition / Composite Block Sports Hall Floor Cleaned, Abraded Line / Court Marked and Sealed by Floorcare Services. This Sports Hall floor is having first coat of Floortech Products – Sportguard heavy duty Sports Hall floor Seal formulated and manufactured to comply with the requirements of B.S. 7044 part 4, Artificial Sports Surfaces and B.S. EN 14904 slip resistance for indoor sports surfaces being applied. All Sports Courts have been over Line / Court Marked in using two pack epoxy paint the re-sealed over for maximum protection. 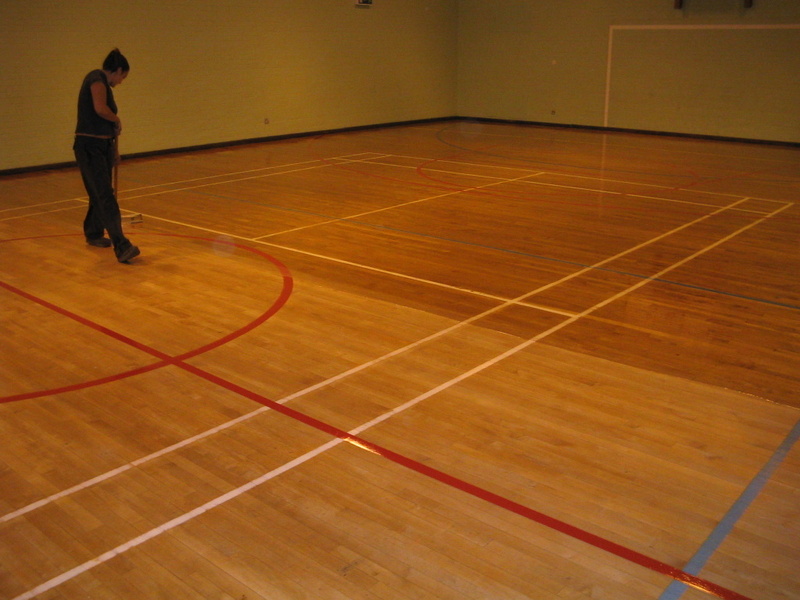 Composition or Composite Block Sports Hall Floor Sanded and Sealed by Floorcare Services. This Composition Block Sports Hall Floor was 100 sqm in area and was Sanded and Sealed with the first coat of Floortech Products – Sportguard heavy duty Sports Hall floor Seal formulated and manufactured to comply with the requirements of B.S. 7044 part 4, Artificial Sports Surfaces and B.S. EN 14904 slip resistance for indoor sports surfaces in just 2 days. The after photo (on the right) shows the Sports Hall Floor after the second coat of seal has been applied, all marks have been removed, Damaged blocks have been filled used the Composition Block dust retained from sanding and is ready for the third and final coat to be applied. 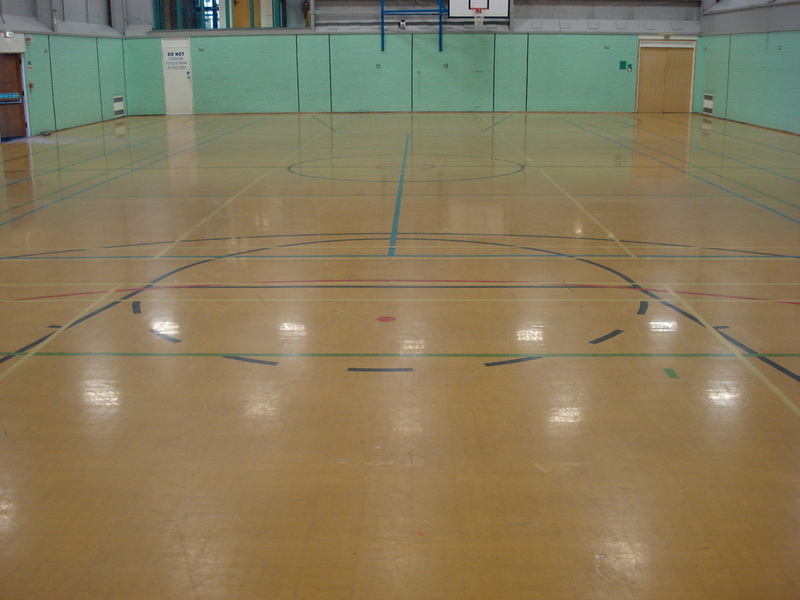 This Sports Hall Floor was Refurbished in Allestree, Derbyshire. Granwood Sports Hall Flooring Cleaned, Abraded and Re-sealed by Floorcare Services. Granwood Sports Hall Flooring Refurbishment. Granwood Floor Cleaning, Abrading, Line / Court Marking and Sealing. Granwood Sports Hall floor Resurfacing.